Tracks and traces, remnants and monuments, the real versus the simulacra, in the wake of globalization. How does the global tourist experience the monument of Buddha attaining enlightenment? What are the terms of global agreement, the investment in an attempt to formulate a visual registration of such an interaction? Examining western values and definitions of the word Enlightenment compared to that of the East, served as a basis for works at the Unesco World Heritage Landmark. Rather than being outside of society, ‘excluded’, beggars play a major role in the economy of Bodh Gaya. Though child labour is objectionable in all aspects of society, especially within India, begging seems to emerge as a job in itself. Beggars have a clear notion of the skills and the self-presentation required to attract money from passers-by. Whilst the beggar sees the donor as a kind of customer, here instead the exchange was negotiated through the distribution of European coinage budgeted from a publicly funded subsidy. 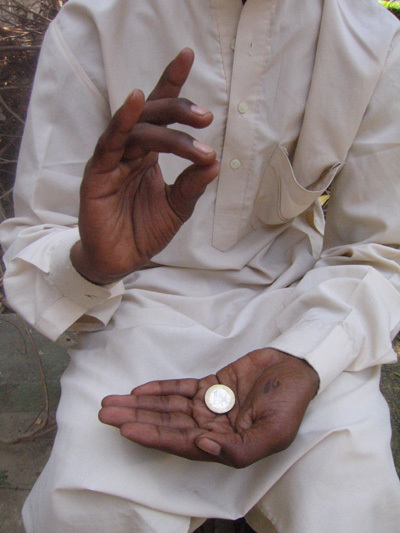 In this case the beggar, a child, reciprocated by performing a Mudra, (a hand gesture associated with the teaching of the Buddha) and displayed the coinage. In Bodh Gaya, every country that celebrates Buddhism has a temple. Competitive through scale, design and ornamentation and scattered around the main temple, each offers a different veneration of Buddhism. Reminiscent of embassies many fly a Mahayana flag, certainly the most ubiquitous object in Bodh Gaya, next to the rickshaws, beggars and litter. Enlightenment Embassy embodies the local embroidery tradition with the creation of a new Mahayana flag: ‘God created man and man returned the favour’. Appliquéd in five languages, it reflects the different modes of communication at the Hotel Embassy: Hindi, English, Japanese, French and Tibetan. The flag was installed from the balcony of the hotel transforming it more into an embassy, reminiscent of the other temples around Bodh Gaya. 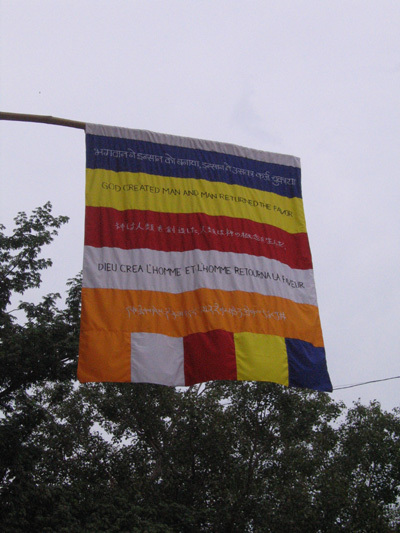 During the week many monks came to view this flag that was causing a stir within the Tibetan community. It seems that the translator, a Tibetan monk, had used words that could not be used in Tibetan to describe god, as there is no exact translation of how one would formulate ‘God’ in Tibetan. After much dispute, the flag was removed and placed elsewhere for the exhibition. ‘God’ got lost in translation. Peacocks are male peafowl and India’s national bird, their feathers like iridescent wisps of beauty created by the Bragg effect. In China, they were the symbol of the Ming dynasty and in the rest of Asia; the feathers of the peacock are considered auspicious and protective. However in Europe, peacock’s feathers are perceived as bad omens, keeping them in the house brings very bad luck, because of their so-called evil eyes. In modern times the peacock has become a symbol of pride, arrogance, and vanity but also a symbol of beauty, prosperity, royalty, love, compassion, the soul, and peace. Scientific research has shown that the female ‘peahen’ chooses her mate by finding the male with the most ‘eyes’, located on his tale. 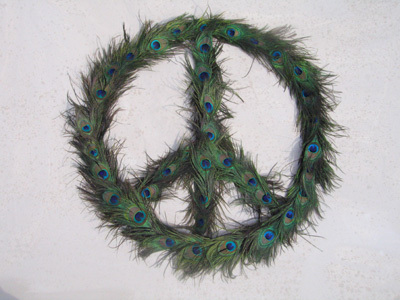 Designed as a the logo for a project that was ‘seeking world peace’, in this piece the 60’s peace sign is combined with the peacock’s manifold symbolic references, united through nomenclature and the form of the circle.